Grape seed extract could be highly effective at preventing infant stomach viruses, research shows. Grape seed extract could be proficient at preventing infant stomach viruses, according to researchers. Scientists from Ghent University in Belgium have discovered that this natural product could be an effective alternative to vaccines in babies. This makes it particularly appealing to parents concerned about inoculating children so early on in life and comes ahead of stomach vaccines being introduced to UK families from September 2013. These are aimed at reducing stomach bugs which cause vomiting and diarrhoea, with half of these food-borne illnesses and stomach upsets related to the norovirus. 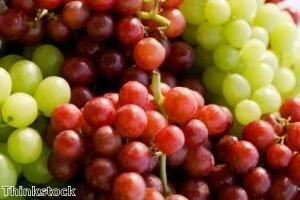 Researchers discovered that the grape seed extract attacks the coating of the virus and disables it. Even small doses of this ingredient succeeded in causing deformities to the cell wall, while higher doses destroyed the virus wall, the study published this month in Applied and Environmental Microbiology explains. "This provides evidence that [grape seed extract] could effectively damage the [norovirus] capsid protein, which could reduce viral binding ability and infectivity accordingly," it reported. Surrogate viruses were used in the tests; however they belonged to the same genus as human norovirus, with a similar genome structure and morphology. Grape seed extract is used today to help treat many conditions related to the heart and blood vessels, such as high cholesterol, poor circulation, high blood pressure, complications related to diabetes, cancer prevention and wound healing. AlphaGuard Plus is based on grape seed extract, and combines with a powerful antioxidant complex to create a full-spectrum food supplement. This all-in-one product features an effective union of vitamin C and E, curcumin extract, zinc, green tea extract, beta-carotene, lycopene and many more nutrients, each working synergistically in the body to promote optimum well-being. AlphaGuard Plus is the ideal food supplement for helping to prevent excessive oxidation and users are recommended to take one or two capsules a day with food to witness the full effects.